The last few weeks are bringing the Monarch butterflies in. They usually miss my plot on their springtime crawl North, but during their escape to the South they come right through. It’s good timing too as it comes about four or five weeks after I’ve given up completely on the vegetable garden and the selfsown Verbena bonariensis have taken over. Last week they were all over the place feeding and fluttering and during the one day of perfect conditions I counted at least 20 in there at one time. They don’t stay long, but walking the paths and having the large orange butterflies lifting up and floating around you on a warm autumn day is a wonderful experience. An airy purple haze of Verbena bonariensis will spring up wherever I leave an unmulched spot of soil. 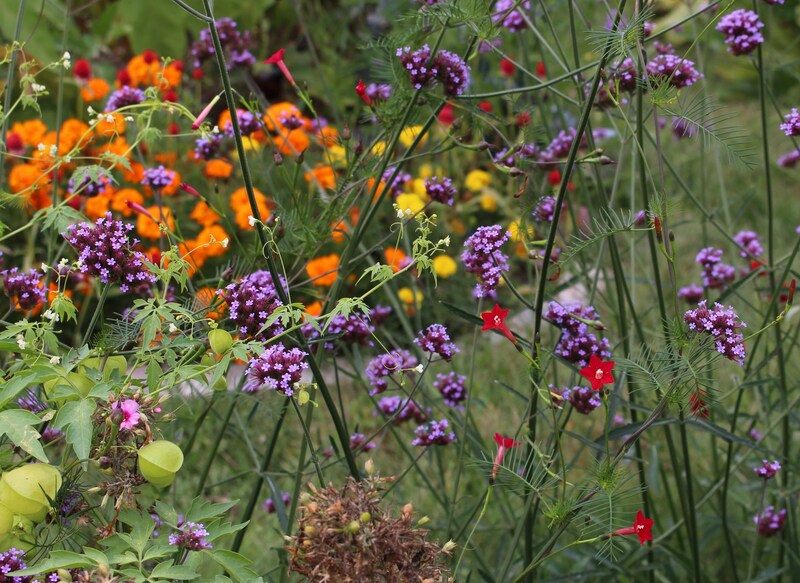 The verbena is clearly a favorite, but other flowers also fill the menu. I don’t think of double dahlias as wildlife-friendly but maybe the color brings in even more dinner guests. I at least think they look great. 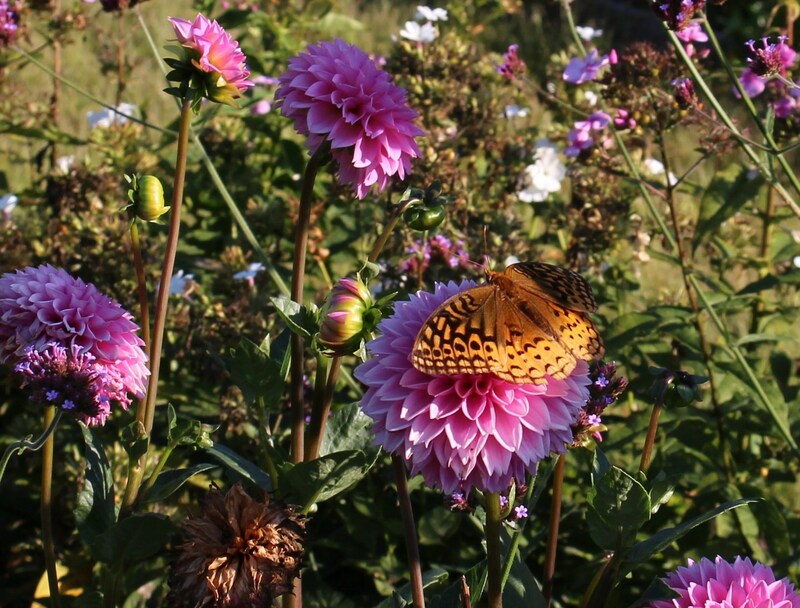 Not a Monarch but still a welcome visitor, this fritillary is taking a break on dahlia ‘Sandra’. My dahlias are not quite where I’d want them to be this year. I’d blame the rains of July but in reality it’s the neglect of August and September which really did them in. Fortunately with some good lighting and a few verbena screening and distracting they still look nice. 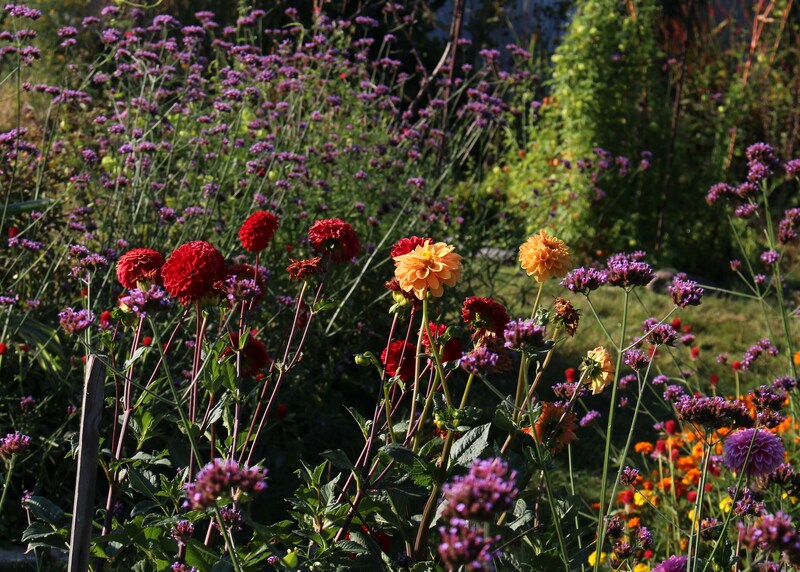 Dahlias and verbena in the morning light. I like that the flowers take over in autumn, and I like that the combinations and players change each year as I gain or lose interest in one thing or another. This year ‘Tiger cub’ corn is back. The seed was a gift from Nan Ondra of Hayefield and I love the variegation but I’m afraid it won’t have time to ripen any seed this fall unless things stay warm late. My fingers are crossed. I love how the bright leaves of the corn go with the bright colors of the red gomphrena and orange marigolds. Word is marigolds are supposed to be a no-no in classy gardens, but I still love their carefree color and I like them even better knowing they’re another gifted plant, this time from Kimberley of Cosmos and Cleome. I did start out with cauliflower here in the spring, but then rather than replant with a fall crop I put in a few ‘QIS red’ gomphrena seedling, a few ‘Tiger cub’ corn kernels, and a few coleus for good measure. I like this autumn mess. Lettuce would be nice too but it’s just been too hot and dry and I just don’t have the ambition to start plants in a shaded spot for transplanting. Plus I can always pick it up at the market… unlike butterflies, those I need the flowers for. In a few spots ‘love in a puff’ and the red blooms of cypress vine (Ipomoea quamoclit) thread their way through the verbena stems. These little surprises make me smile. Here’s another little surprise which I could fill a whole photo album with. This spring I finally seeded out a few Spanish flag vines (Ipomoea lobata), and although they never sprouted in their seedling pots, they did once I threw the leftover soil into the garden. It’s a late bloomer and like many in the morning glory family it can be a little rambunctious, but in this spot it’s perfect. The spent broccoli seed stalks (I suspect I’ll be weeding out tons of broccoli weedlings next spring) and verbena stalks provide just enough support and when a bed to the left opened up after the potato harvest the vines moved right in. I couldn’t have planned the color coordination with the chrysanthemums any better. Ipomoea lobata (Spanish flag) vining through verbena stalks, broccoli stems, and some of my favorite orange chrysanthemums. 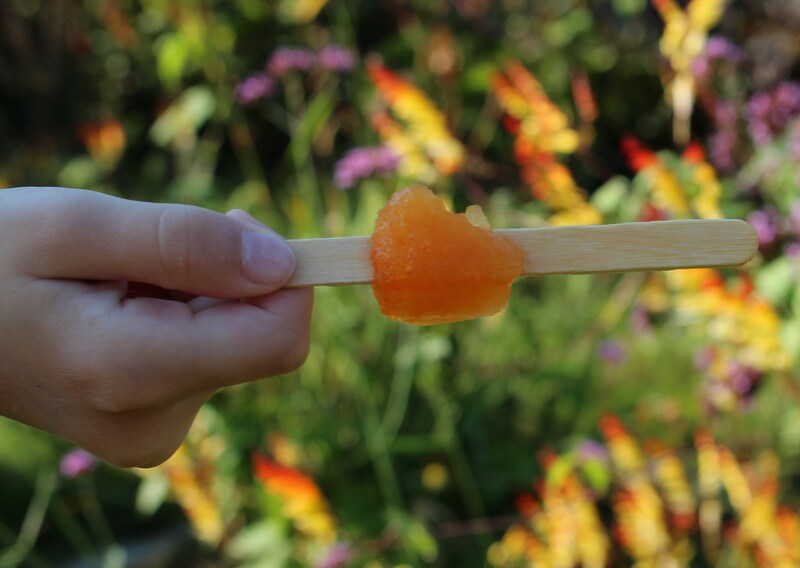 The colors of this planting are the perfect match to my daughter’s favorite orange ice pops… please don’t question why she was eating this while the morning light was still so fresh. Color echoes in an ice pop. I’m not a pink and grey pastel kind of guy so this bold mix of orange and purple really tickles my color bone. Throw in a few hot pink persicarias in front of the dark foliage of the ‘Coppertina’ ninebark (Physocarpus) and I’m more than happy. I just regret that my photo skills weren’t enough to capture it all together in one shot. More orange and purple in the fall garden. Another thing I regret is that the flag vine planted on the deck has turned out to be a much less vibrantly colored plant from a more refined end of the gene pool. When my seeds seemed destined to fail I snapped up a potful found at my favorite nursery. It’s still a very nice thing, and I’ve even grown a paler yellow version before, but I can’t help wish they all had the darker stems and bolder orange of their more common cousin. 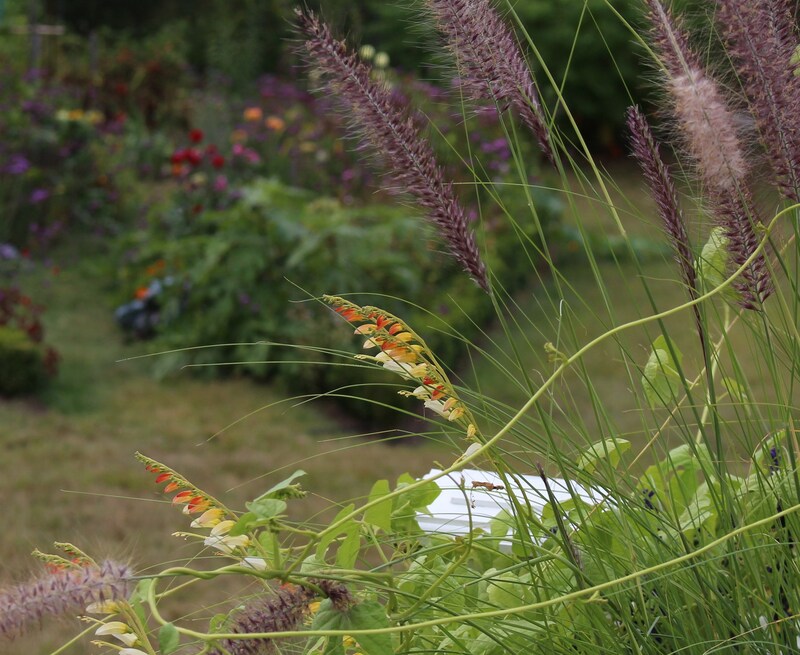 A paler version of Spanish flag grappling through some pennisetum on the deck. The whiter blooms and lighter foliage are nice enough, but I need darker colors to hold up to the white railing. This entry was posted in annuals, dahlias, fall, Uncategorized, vegetable garden and tagged autumn, butterfly gardening, fall, flowers, garden design. ← Wordless Wednesday: ok, it’s fall…. Purple and orange are great together. 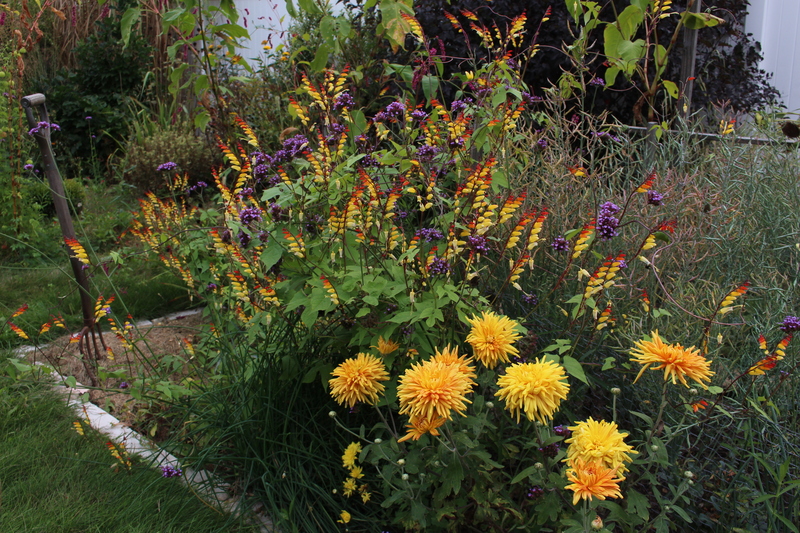 What a serendipitous combination of Spanish flag, chrysanthemum and verbena. If you do manage to get Tiger Cub seeds, I’d like to have a few. I grew some from Nan myself last year, but they didn’t even get to make ears. I will trade you some Glass Gem if you don’t have that. That sounds like a plan, but I do have the glass gem already…maybe a nice big patch of it next year would be fun! Hopefully the seeds set and ripen. I have my doubts looking out at the thermometer this afternoon. Hurrah for the Monarchs! I love that one pic of the non-Monarch. That’s funny about the Spanish Flag. There are certain plants that take off only after you give up on them. Anyway, I love the color and I am tired of non-performing Morning Glories, so I may give Spanish Flag a try next year. Just be prepared to wait if you give the Spanish flag a try. It grows and grows all summer until finally at the end it starts to send up buds. They’re worth the wait though! I love Autumn mess and orange flowers and I know just what you mean about lettuce from the market and having flowers on your veg plot instead. Rambunctious is a great word! Being amongst the Monarchs sounds a magical experience. Haha, I’m glad to hear I’m not the only one who opts for growing soul food rather than actual vegetables! When I think of the work which goes into a bowl of beans it gives me such a sense of respect for the real farmers out there. I still do get a kick out of the butterflies. When the wild ones come in and float around it’s so cool. I rather like that paler Spanish Flag actually, but stronger colours do look especially good in late summer and autumn. I envy you your self- seeding Verbena. Isn’t it wonderful! Mine only manages to produce the odd seedling right in the middle of the pathway! And they are so pretty next to your orange marigolds. I grew some marigolds for the first time this year (but yellow ones) as I had also been persuaded they are no-go. I wasn’t bowled over with them, but they were a pleasant contrast beneath the sunflowers and Tithonia. I read somewhere that the verbena tends to enjoy ‘waste places’. I thought that might be a good description of my garden at times, with its shallow soil and summertime droughts 🙂 Gravel patches and barren ground are where it likes to seed out most of all, and that gives me more plants than I need! I think it’s all the dry and yellowed grass which makes me lean to the darker, bolder colors. A healthy background of fresh green would surely change that opinion! I grew some nice marigolds last year, airy delicate things… but I have to admit I like the dumpy overbred ones too! All those hot colours work fabulously together, I love it all Frank. I think you were lucky those seeds germinated when you threw the soil down, it never happens to me! Verbena bonariensis seems to be number 1 with most butterflies and other pollinators and it grows well in such varied locations, looks great everywhere it puts itself so there’s no reason why we all shouldn’t be growing more of it! Have a great weekend. 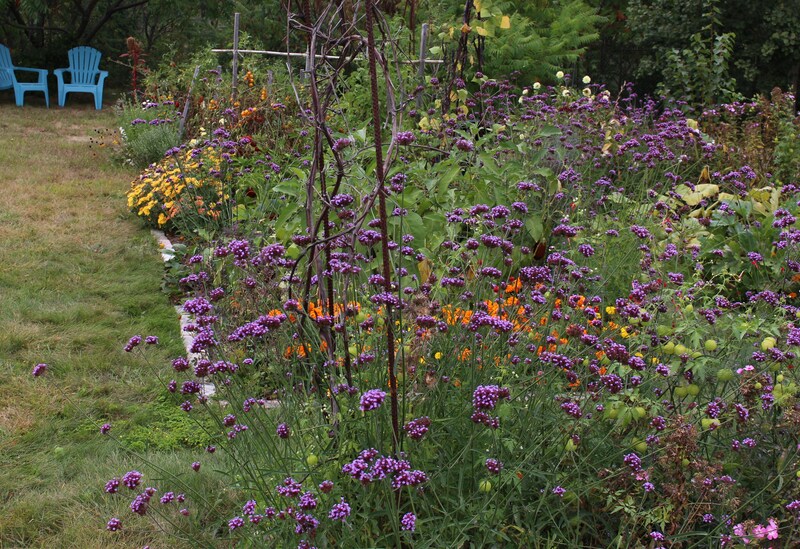 If pushed I may list verbena as one of my best and most reliable summer bloomers. I love the color and the butterflies are always entertaining, plus the hummingbirds stop in as well every now and then. How could I deny all these garden friends a meal? I’m loving the colours – they work so well together. It’s always sad when a wonderful plant such as marigold gets put-down by the style police…ten years ago it was dahlias….thank goodness you are flying the flag! There are so many less than perfect areas in my garden, worrying about the style police is the least of my worries. The marigolds are safe here! How wonderful having all these butterflies. I love all your late summer bloomers, specially all the orange. 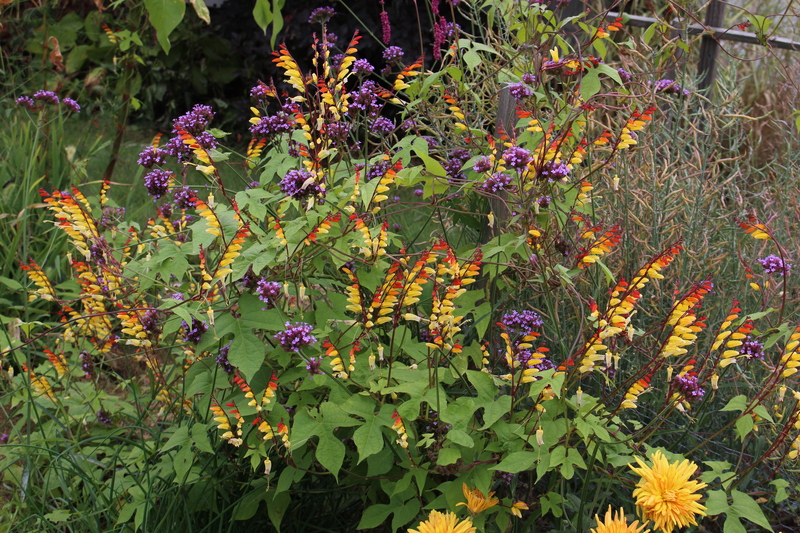 I am going to try the Ipomaea lobata next year, it’ s so pretty. Has it’ s name changed? I thought it used to be Mina lobata. As far as I know the Mina lobata name was replaced when they lumped it into the morning glory clan. I preferred the easy to spell old name of course. Orange has become a more and more useful color for me. Maybe my eyes are going in my older years. 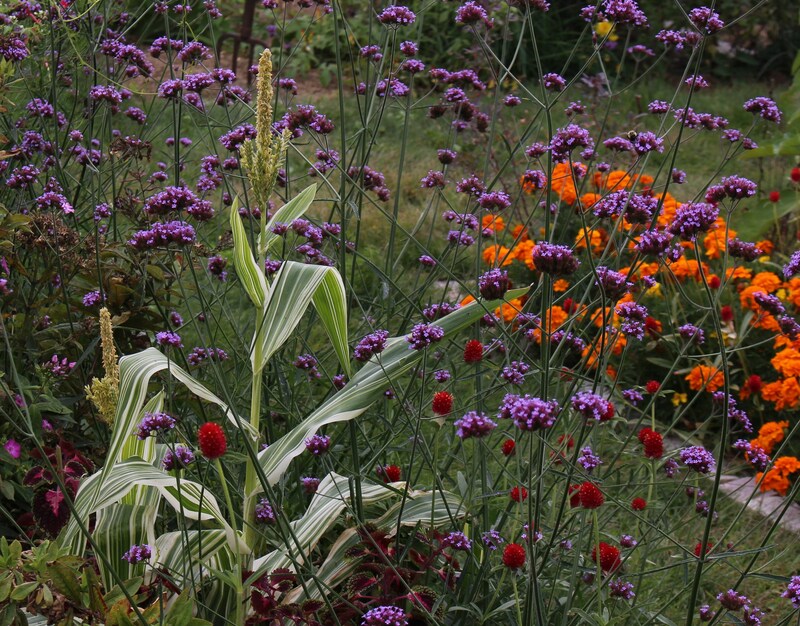 Love your Spanish Flag and Verbena together, I wish my Verbena would seed around like that! You have so many beautiful flowers to attract the butterflies, they must enjoy their stop in your garden. Not to brag but I pull handfuls of the verbena out each spring. It does especially well wherever the soil has been disturbed or bare earth sits unplanted. Even the thinnest mulch will prevent reseeding and typically our winters are to harsh for it to perennialize. You know you’re a successful gardener when the Monarchs annoint you a way station! I love the riot of color and imagine working in your garden with the butterflies fluttering is deeply satisfying! It does feel good to have the butterflies, other insects, and birds going back and forth in the garden while I work. The whole place seems so much more than just pretty then! Do you have any problems with Verbena bonariensis being invasive. it does a lot of seeding here and can be a challenge to keep on top of it. I don’t have a problem with it, but it does come up thickly whenever a vegetable bed is turned for planting and then remains unmulched. There must be billions of seeds in the soil waiting to sprout! Our typical winter kills the old plants, so they’re not a problem and I’ve only seen an odd plant or two sprout up outside the garden from washed away seed. Mulch seems to eliminate it from the weedy category, but we of course are much cooler up here than you are. The Monarchs must love Verbena bonariensis. I finally saw a couple in my garden a few days ago, and those were the flowers they chose here, too! Love that gorgeous Spanish flag! I love oranges and reds in the garden – they look so cheerful and bright. Oh, I’m glad you showed the Ipomoea, since I was not able to get mine planted this year. I like the more vivid variety, myself. I wonder if I throw some of the seeds in the ground now, whether they’ll come up next spring, and maybe have a bit of a head start. I know the seeds from regular morning glories self-sow quite reliably! I used to not like marigolds, myself, but now there are so many different varieties, almost anyone is sure to find a pleasing one! The few I put out in mid-July are looking better now than they have all summer, and the yellows and oranges are great for this time of year! I’ve seen a few Monarchs around (they really like my zinnias), but not 20 at a time by any means! Still, I’ve seen more this fall than the previous few years, so that’s a good sign, right? Glad for the rain, but not happy that we needed to turn the heat on last night. Had kids who were chilled to the bone when they got home from the football game in Tunkhannock! Finally, I completely understand the phenomenon of children eating popsicles in the morning! At least she had the rest of the day to burn off the sugar! Oh good. No one else mentioned the popsicle so I was worried they were all politely ignoring my questionable parenting skills! The heat went on here too but I hope next week gives us a little break again. I’m sadly realizing that the days of frost-free bliss are winding down and I really have to face the reality of bringing things indoors and battening down the hatches for winter. At least I have indoor sports like swimming to look forward to as opposed to football games!